Check out the SAE Clean Snowmobile Competition 2010 video by Bill Bennett and posted by Robert Baratano on Vimeo. Each March the Keweenaw Research Center (KRC), a research institute of Michigan Technical University, hosts the Clean Snowmobile Challenge, in Houghton, Michigan. One of the newest of the SAE (Society of Automotive Engineers) International Collegiate Design Series, the competition celebrates innovative design by college teams from around the U.S. and Canada who compete for cash prizes and bragging rights. Environmental engineer Lori Fussell, and Teton County Commissioner Bill Paddleford, started the Clean Snowmobile Challenge in 2000. Inspired to create cleaner and quieter snowmobiles following years of controversy and high-level litigation surrounding loud, smoke-belching sled use in Yellowstone National Park, Fussell and Paddleford teamed with SAE to create the first challenge in Jackson, Wyoming. 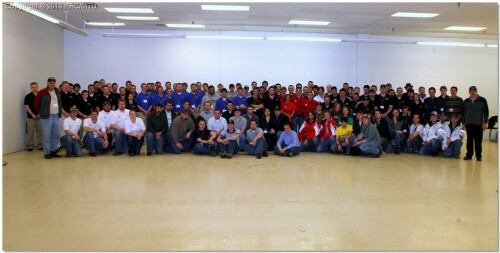 The SAE provided used sleds to each of the seven competing teams, who were given guidelines about using existing technologies and redesigning existing engines. As a result of the early contests, most snowmobile manufacturers now offer a clean option. 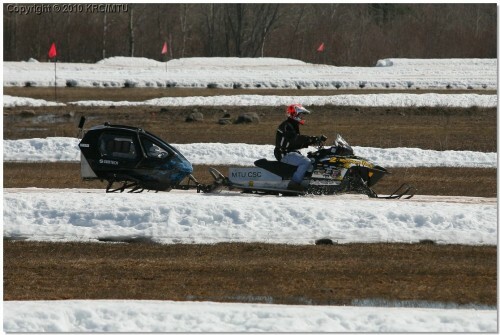 Jay Meldrum, Director of the Keweenaw Research Center at Michigan Tech and member of the SAE, moved the Clean Snowmobile Challenge to the school’s winter test course in 2003. Up to 25 intercollegiate teams of between 4 and 60 students may compete in Internal Combustion Engine (ICE) and/or Zero Emissions categories. Typically, 15-18 teams participate in the challenge with 12-14 teams entered in the ICE category only. At some universities the challenge is an enterprise program wherein students receive credits toward their required senior design projects as they would in a class. At some universities, the teams are club teams and students receive no course credit. In either case the purpose, Meldrum says, is four-fold -- less noise and emissions, more safety and fun! Meldrum started the Zero Emissions category following McGill University’s electric sled demo during the 2005 competition. Working with Polar Field Service’s very own Tracy Dahl to design a zero emission snowmobile for use in polar science, the McGill team improved on their design over the next year so that it could run on its own power and have sufficient range to be useful in Arctic conditions. These days, five or six teams routinely enter the Zero Emissions competition (and Tracy Dahl now helps judge the competition) where teams battle to be the best in range, range while carrying a load, and the draw bar pull. An NSF grant provides travel reimbursements of up to $2000 for each team. Hundreds of volunteers, sponsors, and supporters inundate the small town each year for the week-long event. Meldrum’s personal challenge is to secure food, lodging, equipment, facilities, and funding for the event, which may cost up to $200,000. Two weeks prior to the Challenge, teams submit papers, which include the details of their designs and technical specifications. Papers are reviewed by a panel of professionals including snowmobile manufacturers and engineers. During the week in Houghton, teams compete in a number of indoor and outdoor Challenge events with emphasis placed on emissions, noise, and fuel economy. The first event (following safety inspections) is the Endurance Run, a 100-mile race which begins at the research center’s test course. Sleds in the ICE category attempt to reach Copper Lake on the northern end of Michigan’s Upper Peninsula. Some snowmobiles make it and some don’t. Teams must present their papers orally; they are judged on their design, logic, and clarity. Lab measurements rate emissions (by EPA standards) and noise (also rated subjectively). Objective and subjective ride tests rate handling and performance. Acceleration is also evaluated – horsepower is limited and safety is stressed. In static displays, students may interact with judges and supporters in a casual “show and tell” setting. The Clean Snowmobile Challenge culminates with the much-anticipated awards banquet. Each participant receives a plaque and awards range from Rookie of the Challenge to Most Sportsmanlike to Best Value. But the real drama is for First, Second, and Third Winner Overall – even Meldrum, who MCs the event, doesn’t know the winners until about an hour before the envelope is torn open. Cash prizes of $1000, $750, and $500 are awarded to first, second, and third place overall teams in each category. A member of the winning Zero Emissions team is invited to test the winning snowmobile at Summit Station in Greenland the following summer.